Trishul Bhaint Yatra is organized annually to the Chandi Mata Temple at Bhaderwah region in Jammu and Kashmir. The temple is located at Chinote Village. 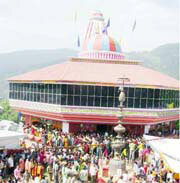 Chandi Mata Temple is dedicated to Goddess Shakti. This is a very old sacred place. The temple was renovated recently.